Tyler Durdencat ! This is a great set of links, thank you. The thing I find the most intriguing about this movie is how Llewyn starts off looking (to me) so very attractive and then as things head further and further south for him and you get a picture of who he is, his appeal starts to decline; he's still gorgeous but it's tinged with rot, somehow. Amazing music and performances. 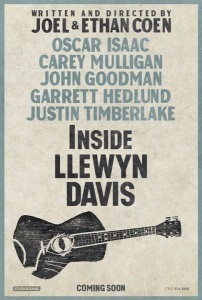 One of my favourite Coen brother movies. I really enjoyed this. It was funny. I wouldn't go as far as to say it had compassion for the characters, but it had a sort of fondness for everyone. The music (both the good and the intentionally mediocre) was perfect. I had a feeling of being there, which was super fun. I don't think it had something especially important to say, but it was a really entertaining watch and was effective at what it did. Yeah the links in this post are great. I forgot how terrible/funny the Please Mister Kennedy bit was.